The conservation area offers over seven miles of trails for hiking, mountain biking and horseback riding. Park trails range in length from 1.2 miles to 4.6 miles and range in difficulty from easy to difficult. 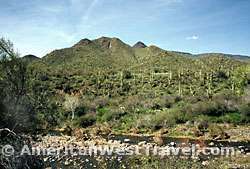 The elevation and dense vegetation make hiking relatively comfortable for a large portion of the year. The main trail running along Cave Creek connects to the popular trail system in the Tonto National Forest. However the trail does cross the creek several times, and the crossings can be difficult, or at least wet, when the creek is high (such as in the photo above). One of the more scenic but difficult trails accesses Elephant Mountain (photo, right). Rangers offer interpretive programs on an ongoing basis. For a program schedule, more infomration, or to obtain hiking maps, visit the Maricopa County Parks & Recreation Department's web site. 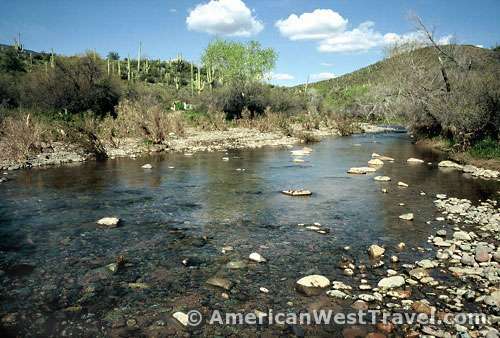 To reach the conservation area, drive 4.5 miles north on Spur Cross Road, from Cave Creek Road in downtown Cave Creek, to the designated parking area. Entry is $3 per person. This unique area was protected from development and made accessible to the public through years of effort by concerned members of the community. 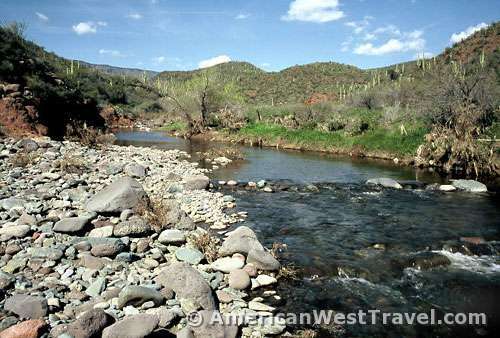 To reach Spur Cross Ranch Conservation Area, go north of Phoenix via Interstate-17, then east on Carefree Highway (state-74), left on Cave Creek Road, and left on Spur Cross Road.